UPDATED Jan. 18, 2019. There are so many questions about Medicare! The material presented below will be helpful for understanding Medicare basics and answering Medicare questions. 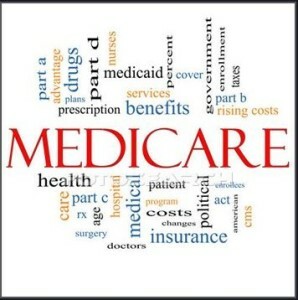 Medicare Part A and Part B are known as Original Medicare and are run by the Federal government. Medicare Advantage (Part C) and Medicare Prescription Drug Coverage (Part D) are sold by private insurance companies. Medicare Supplement (Medigap) insurance is designed to fill in the gaps that Original Medicare does not cover. Medigap is not a part of the Federal Medicare program. Instead, private insurance companies sell it. Part A covers inpatient hospital care, inpatient care in a skilled nursing facility, hospice care services, and home health care services. Part A allows you to use any doctor, specialist, or hospital that accepts Medicare. You do not need a referral, but deductibles, copayments, or coinsurance may apply for each provided service. Most people age 65 or older don’t have to pay a monthly payment (called a premium) for Part A because the individual or their spouse paid Medicare taxes while they were working (40 or more quarters of Medicare-covered employment). Learn more about Part A (Hospital Insurance). Part B covers medically-necessary doctors’ services, outpatient care, home health services, durable medical equipment, and other medical services. Part B also covers many preventative services. As a basic rule, most people age 65 or older pay the standard monthly Part B premium. Learn more about Part B (Medical Insurance). Another way to cover all Original Medicare services (Part A and B) is through Medicare-approved private insurance companies offering Advantage Plans. The essential benefits of Advantage Plans include extra coverage (sometimes for an additional cost), such as vision, hearing, dental, and health/wellness programs which Original Medicare does not cover. Advantage Plans frequently include Prescription Drug Coverage (Part D) as well. Medicare Part D, also known as Medicare Prescription Drug Plan, helps to lower the cost of most generic and many commonly used brand name prescription drugs. You may enroll in the stand-alone Prescription Drug Plan (PDP), which are run by private insurance companies that have been approved by Medicare. Alternatively, you may enroll in the Advantage plan that usually includes PDP. All Prescription Drug Plans must have at least a standard level of coverage set by Medicare, but each plan can vary in cost to you and the drugs covered. If you need help selecting the drug plan for your specific prescriptions, please give us a call at 877-657-7477, or fill our Medicare Quote form. Our services are offered at no cost to you, so if you are thinking about a Prescription Drug Plan, let us help you. If you have limited income and resources, you may qualify for Extra Help. Learn more about Medicare Prescription Drug Plans. A Medigap Plan helps to fill the gaps (such as deductibles, copayments/coinsurances, and excess charges) in Parts A and B of Original Medicare. Medigap is a health policy sold by private insurance companies that are licensed within your state. The payments are made after Medicare has paid its share of the bill. Medigap benefits include some extra benefits not covered by Original Medicare, such as foreign travel emergency. There are 10 Standardized Medigap Plans. Keep in mind that a plan bought from one insurance company offers benefits that are identical with a plan of the same type purchased from any other company. Liberty Medicare specializes in helping people choose the right Medigap Plan for their needs, all without overpaying. If you need help selecting the right Medigap Plan, please give us a call at 877-657-7477, or fill our Medicare Quote form. Our services are offered to you at no cost, so if you are thinking about a Medigap Plan, let us help you. Learn more about Medicare Supplement Plans. I am still working. Do I need Medicare Part A? Even if you continue to work after age 65, you should still sign up for Medicare Part A. Signing up for Part A may help you to cover some costs not covered by the employer group plan, and it’s free for most people. I am still working and covered under the employer group health insurance. Does it make sense for me to enroll in Medicare Part B? Which coverage will be the ‘primary payer’? Are other family members covered by the employer health insurance? What is the Part B Special Enrollment Period? The Special Enrollment Period allows you to delay the Part B enrollment without paying a higher premium. Please note, that only employee coverage can be used to defer Plan B; neither COBRA nor retiree coverage can be used to delay Plan B. You have 8 months to sign up for Part B; therefore if you choose COBRA, don’t wait until your COBRA ends to enroll in Part B. Do I need to join a Part D if I already have prescription drug coverage? You will need to check into your existing prescription drug coverage. Unless you have the Creditable Prescription Drug Coverage (i.e., at least as good as the standard Medicare prescription drug coverage), you want to join Plan D when you are first eligible. You may have to pay the penalty if you decide to join later. Can I have additional health insurance coverage when I have Medicare? You may combine Medicare with other insurances such as employer health plan insurance. Check which plan is the primary payer. Also, if you have the Original Medicare, you may buy the Medigap insurance which will protect you against catastrophic out-of-pocket costs. Liberty Medicare is here to help you in all stages of comparing, selecting and enrolling in the best and most suitable Medicare Plan for you. If you are looking for Medicare coverage, let us help you. To view real quotes from Medicare plan providers, please fill out our Medicare Quote form, or give us a call at 877-657-7477.